When I first met Emily and Christian I instantly knew it was a match made in heaven! He is completely enamored by her and it was so much fun to capture it on their wedding day. 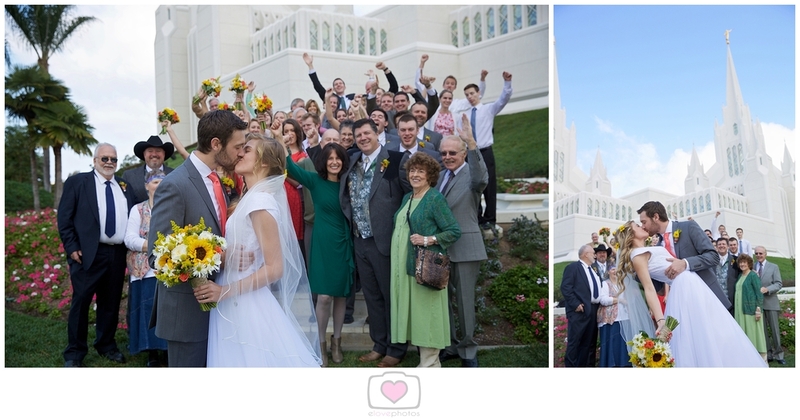 Besides meeting this amazing couple, I was able to shoot their incredible wedding at the beautiful San Diego Temple. They had the most unique wedding theme, EVER! It was a little bit country with mixes of coral, yellow and camouflage! Yes, you heard that right--CAMOFLAUGE! And it was awesome! It fit their personalities perfectly and it was fun to capture. Please enjoy a sampling of their fabulous wedding day with a few thoughts in between photos and list of vendors at the end. Shot gun shell boutonnieres and camo ties! How cool is that? So tastefully done by the incredible Flour & Flower Designs! Swooning over here.....look at the way he smiles at her!!! Coral cowboy boots were the perfect touch to Emily's dress! We also stopped a yellow flower field to add variety to their portraits. The backdrop and natural setting seemed to fit perfectly with their wedding theme! Here are a few pictures of their invitation and bridal details. Since I live in Virginia, I wasn't able to do their engagements until the week of the wedding, but I loved their adorable pictures where Christian is wearing a John Deere hat! The reception was held at the OC Sailing & Events Center in Dana Point, CA. It was right on the marina and it was the perfect location! Get read for detail shot overload! This cake!!!!!! Are those deer not the cutest things you've ever seen????? I just adored that cake! It was perfect and I've never seen anything like it. SIMPLY PERFECT! Their dads were hilarious. Their speeches were the perfect mix of heartfelt thoughts and comedy!